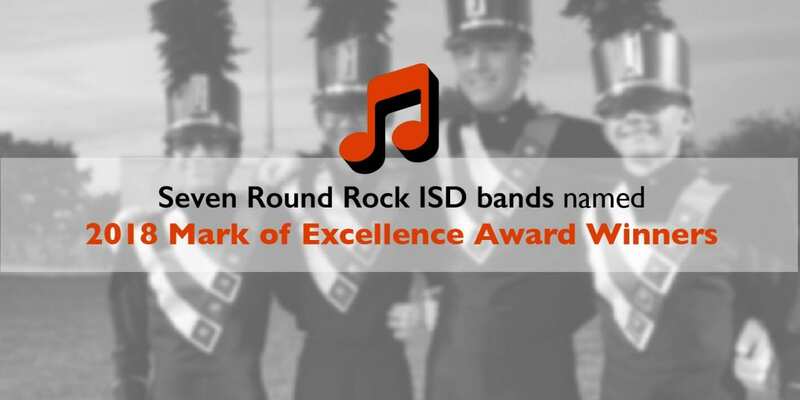 The Foundation of Music Education has awarded seven Round Rock ISD bands from seven District campuses a total of eight Mark of Excellence and Citation of Excellence awards during its annual award program. The Canyon Vista Middle School Honors Orchestra, directed by Ragan Whatley, has been selected as a National Winner in the Mark of Excellence / National Orchestra Honors project. The Round Rock High School Symphony Orchestra, directed by Sandra Vandertulip, is a Commended Winner in the Mark of Excellence/National Orchestra Honors project in the Full Orchestra category. The Westwood High School Symphony Orchestra, directed by Joshua Thompson and Jack Green (retired), is a National Winner in the Mark of Excellence / National Orchestra Honors project. The Round Rock High School Symphony Orchestra, directed by Sandra Vandertulip, is a Commended Winner in the Mark of Excellence / National Orchestra Honors project in the String Orchestra category. The Cedar Valley Middle School Honors Band, directed by Pete Alvarado, is a National Winner in the Mark of Excellence / National Wind Band Honors project. The Cedar Ridge High School Wind Ensemble, directed by Nolan Loyde (currently RRISD Assistant Director of Instrumental Music), is a Commended Winner in the Mark of Excellence / National Wind Band Honors project. The Walsh Middle School Honor Band, directed by Jennifer Bergeron, is a National Winner in the Mark of Excellence / National Wind Band Honors project. The McNeil High School Wind Symphony, directed by Joshua Munoz, is a Commended Winner in the Citation of Excellence. The Mark of Excellence consists of the National Wind Band Honors, National Choral Honors, National Orchestra Honors, National Jazz Honors, and National Percussion Ensemble Honors. It is a competition, entered by recordings, in which the top quarter are selected as National Winners and the second quarter receive Commended Honors. This year 279 of the finest musical ensembles in the nation entered the competition. The project has now received entries from thirty-eight states. All the groups receive recorded and written comments from the adjudicators, and also a compilation recording of the performances of the National Winners. These Round Rock ISD ensembles are wonderful examples of musical achievement and are a tremendous credit to the Round Rock ISD.